First Edition; 8vo; pp. 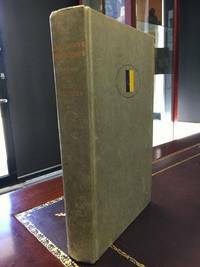 (x), 261; original papered boards with cloth binding, dustjacket, a fine copy. New York, Henry Holt And Company, (1990). G. W. L. Marshall-Hall Portrait Of A Lost Crusader. 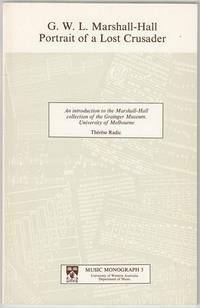 : An Introduction to the Marshall-Hall collection of the Grainger Museum, University of Melbourne. 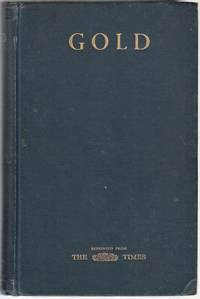 (Nedlands), Department of Music, University of Western Australia, (1982). . First Edition; 8vo; pp. xii, 58; 5 b/w illustrations, references, index to the catalogue; original stiff wrapper, minor crease to back of wrapper, otherwise a very good copy. G for George. 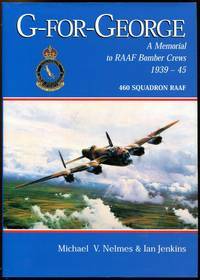 : A memorial to RAAF bomber crews 1939-45. NELMES, MICHAEL V; JENKINS, IAN. Banner Books, 2000.. 8vo; pp. 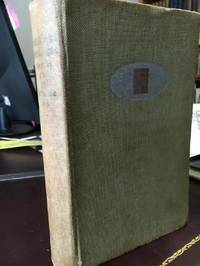 240; illustrated endpapers, profusely illustrated throughout, appendices, references; original cloth, dustjacket; a fine copy. GAB Field Days Mungerannie 2002.
n.p. n.d. (c. 2002).. 8vo; pp. 16; original stiff illustrated stapled wrapper, a fine copy. London, Little, Brown and Company, (2000).. Reprint, Lge. 4to. pp. 320; Colour portrait frontispiece; 130 colour plates, numerous colour illustrations within the text; list of plates, guide to the principle personalities and organizations mentioned, index, sources and bibliography; minor rubbing to dust jacket; otherwise a fine copy. GOLD. : A Reprint of the Special Number of The Times. Tuesday, June 20, 1933. 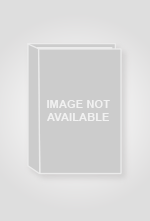 London, The Times Publishing Company, 1933. . 8vo; pp. xii, 238; frontispiece, 26 b/w photographic plates, 1 folding chart at rear; original blue cloth, title lettered in gilt on spine and front, previous owner's inscription to front free endpaper, wear to corners and edges of cloth, spine cracked at endpapers, spine cocked, a good copy. 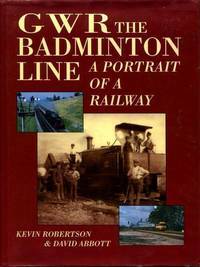 GWR The Badminton Line. : A Portrait Of A Railway. (Pheonix Mill), Alan Sutton, (1997).. Reprint; 4to; pp. x, 233; illustrated endpapers, numerous b/w illustrations, appendices, original cloth, dustjacket, a fine copy. Gables, Girders & Glorious Gold. : The Illustrated living history of Clunes, Talbot & Surrounding Districts. Vermont South, David Williams, (2003).. First Edition; Oblong 8vo; pp. 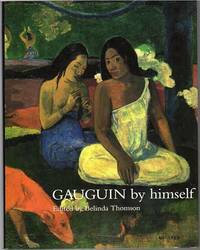 88; profusely illustrated with b/w sketches, colour sketches; original stiff illustrated wrapper, a fine copy. New York, Prentice Hall Press, (1987).. First Edition; 8vo; pp. 304; 8 pages of b/w plates, chronology of Clark Gable's films, index; original cloth, dustjacket, stamp on pre-title page, otherwise a very good copy. 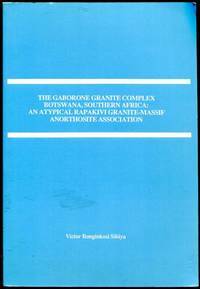 The Gaborone Granite Complex Botswana, Southern Africa: An Atypical Rapakivi Granite-Massif Anorthosite Association. Amsterda,. Free University Press, 1988.. 4to; pp. xxix 449; maps, diagrams, tables, references, appendices; original stiff wrapper; spine cocked; otherwise a very good copy. Text in Dutch and English. London, Jonathan Cape, 1986. . Reprint; 8vo; pp. 331; original cloth, dustjacket, inscribed by the author on title page, minor closed tear to page 290, minor fading to spine, otherwise a very good copy. (New York), Viking, (1987). . First US Edition; 8vo; pp. 331; original cloth, dustjacket, inscribed by the author on title page, remainder mark on front edge, price clipped, otherwise a very good copy. Gadsden. 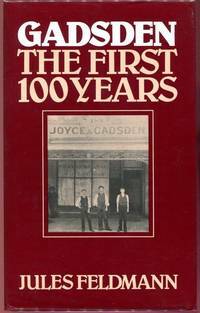 The First 100 Years. J. Gadsden, 1980.. First Edition; 8vo; pp. iii, 169; 1 colour plate, some b/w illustrations, list of long serving employees, original papered boards, dustjacket, minor chipping on front board near top of spine, otherwise a very good copy. Gall & Inglis' County Maps of England. Cheshire. : For Cyclists, Tourists, &c.
16mo; 1 large folding map 500mm x 635mm, 70 mm closed tear to bottom of map, 24 small marks made with black ink, original red cloth, title and illustration in black on front board, minor fading from water damage mainly to rear, a good copy. London and Edinburgh, Gall & Inglis, n.d.
Gallant Gentlemen. : A portrait of the Brittish Officer 1600 - 1956. London, Michael Joseph, (1956).. First UK Edition; 8vo; pp. 345; 22 sketch illustrations, index; original blue cloth with gilt title on spine, minor bumping to head and tail of spine, minor flecking to cloth, previous owner's name on front free endpaper, minor browning to endpapers, minor flecking to page edges, a good copy. London, Hutchison and Co, (1973). . First Edition; 8vo; pp. 303; illustrated endpapers, frontispiece, 12 pages of b/w plates, sources, notes, index; original blue cloth, title lettered in silver on spine, dustjacket, spine faded, minor flecking to page edges, otherwise a very good copy. London, Hurst and Brackett, (1934). . Sixth Impression; 8vo; pp. 296; frontispiece, 31 illustrations, 5 maps, index; original blue cloth, title lettered in gilt on spine, spine faded, minor bumping to corners, bookshop stamp to front endpaper, a good copy. 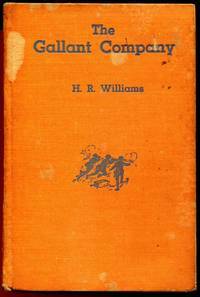 The Gallant Company. : An Australian Soldier's Story Of 1915-1918. Sydney, Angus & Robertson Limited, 1933.. Second Edition; Sm. 8vo; pp. x, 276, list of publications, list of authors; original orange cloth, flecking to page edges and pages throughout, browned endpapers, cocked spine, wear to front cover and spine, a good copy. Galleghan's Greyhounds The Story Of The 2/30th Australian Infantry Battalion 22nd November, 1940 - 10th October, 1945. PENFOLD, A. W; BAYLISS, W. C; CRISPIN, K. E.
Sydney, 2/30th Bn. A.I.F. Association, 1949. First Edition; Demy 8vo; pp. xviii, 406; portrait frontispiece, illustrated with 25 photographic plates, appendix, list of decorations awarded and list of recommendations for decoration, roll of members, summary of casualties, original green cloth browned and worn, title lettered in gilt on spine, battalion insignia on front board, pages a little browned spine cocked, fair copy of the very scarce first edition. The 2/30th Battalion was raised in late 1940 as part of the all volunteer Second Australian Imperial Force, the battalion formed part of the 27th Brigade, which was assigned to the 8th Division. In mid-1941, the battalion was deployed to Malaya, as the garrison there was increased amidst rising tensions in the Pacific. In early 1942, it fought against the Japanese during the Malayan Campaign and the Battle of Singapore, where it was captured in February 1942. many of the 2/30th's personnel died in captivity before the war ended in August 1945. Galleghan's Greyhounds: The Story of the 2/30th Australian Infantry Battalion. 22nd November, 1940 - 10th October, 1945. PENFOLD, A. W ; BAYLISS, W. C ; CRISPIN, K. E.
Sydney, 2/30th Bn. A.I.F. Association, 1979.. Reprint; 8vo; pp. xviii, 405; portrait frontispiece, 25 illustrations, list of decorations awarded and list of recommendations for decoration, roll of members, summary of casualties, original grey cloth a little rubbed, title lettered in gilt on spine, decoration on front board, good copy.